In the mid-70s, reggae, punk and disco pushed and shoved a complacent rock scene into new musical frontiers. When two Syracuse University buddies, Ian Schrager and Steve Rubell, with the aid of $500k from silent partner, Jack Dushey, converted an old CBS TV studio in mid-town Manhattan into the legendary dance club, Studio 54, disco got a cocaine fueled boost into the mainstream. From 1977 to 1980, the club became mythic as a hedonistic living theater for celebrities, jet setters (or what was not so long ago called Eurotrash), bohemians, gays, die-hard eccentrics and people who just wanted to dance the night away. Matt Tyrnauer (best known for Valentino: The Last Emperor) goes beyond mere retro nostalgia in this documentary thanks to gaining the trust and participation of Schrager (Rubell died of AIDS in 1989). Schrager’s low-key, gravelly voiced remembrances give this true-life tale of entrepreneurial zeal and hubris, Weimer-like decadence and son et lumiere spectacle its narrative backbeat. Rubell was the giddy front man, making sure all the beautiful people, famous or should be famous, got in and the “bridge and tunnel” types were kept behind the ropes on the red carpet. In contrast, Schrager was the brooding director in the wings pushing the concept of a dance club into the realm of Hesse’s magic theatre. His grand illusions could include everything from a stage backdrop that featured the man in the moon snorting coke or Busby Berkeley-like chorus girls and bus boys on roller skates and live performances by Grace Jones, Sylvester or Klaus Nomi. The two partners, proverbial victims of their all too surreal success, became unstuck when their penchant for skimming the profits of the club to avoid paying taxes caught the attention of the IRS. The tip-off came from Rubell, who bragged to New York Magazine that only the mafia was making more money. A police raid of the club uncovered boxes of cash, an alternate set of ledgers and quelle surprise, some drugs. Their legal defense was spearheaded by the notorious Roy Cohn, a closeted self-hating Jew who was Senator Joe McCarthy’s legal henchman during the red baiting 50s and counted John Gotti and Donald Trump as friends and clients. Cohn’s convoluted defense dragged in 34 other lawyers including such respected counsellors as Arthur Liman, who would later chair the Senate investigation into the Iran-Contra affair in 1987. But as a police detective says in the film, Schrager and Rubell skimmed on such a scale, and with none of the skill of the mob, that jail time was inevitable. The two were lucky, white and had enough money to only get two years in the same prison. Schrager bribed an intimidating con for protection. They also agreed to testify against other club owners dodging tax to get their sentence cut to 13 months. Upon release, they sold off Studio 54, which thrived for a few more years on its allure and reinvented themselves with new ventures such as the Palladium. Schrager then invented the con-cept of the boutique hotel with places like the Royalton and Gramercy Park Hotel. As developers go, Schrager is now the anti-Trump – driven by a genuine interest in business innovation, love of design and the arts, and judging by the library in his Southampton mansion, ability to read a book that wasn’t ghost written. Matt Tyrnauer does a thorough job of assembling recent interviews, TV news accounts, rare club footage shot by film students and other archival sources into a compelling 98 minutes. What the film lacks, at times, is a perspective deeper than “and then the music had to stop.” The club’s “golden age” mystique doesn’t always sit nicely with the knowledge that Studio 54 was also a symbol of one per cent self-absorption and “let them eat” cake elitism that savvy club owners have exploited before and after. And when the likes of human rottweiler Roy Cohn are your house counsel, the notion of Studio 54 as a utopian laboratory of self-expression and liberation now seems specious; forgiven by being young at the time and suddenly having it all. 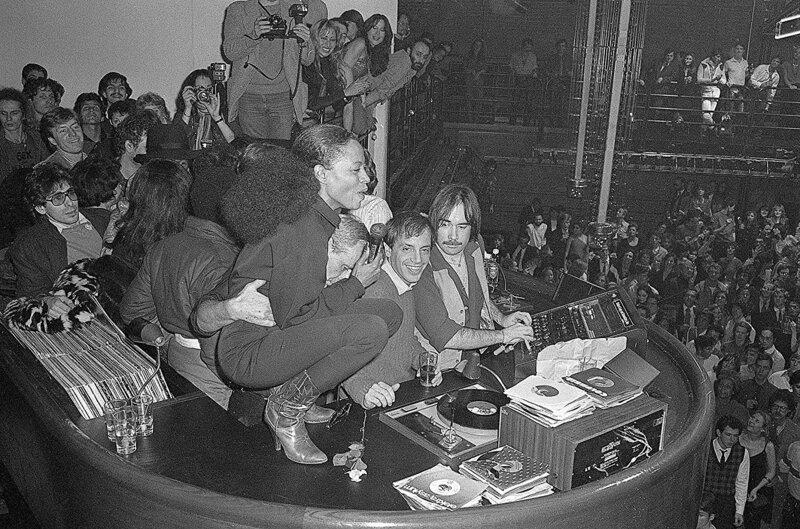 To be blunt, Studio 54 was often just the most popular place to get high or laid of its era. As the 80s progressed and Studio 54, under new ownership became just another Manhattan club, the pull of the nightlife for regulars was affected by substance abuse issues, money problems, the death of so many friends from AIDS and simply getting old. The uptowners still had Elaine’s and the downtown kids now had new venues like Danceteria and CBGBs to The Bottom Line, the sheer reliability of Greenwich Village and the emergence of SoHo as the next hood du jour. The dogs bark, but the limo service to the next scene moves on. What Studio 54 did best, and where this doc stays on target, was sell its mirror ball reflection to a world beyond its blacked out front door. It mixed ubiquitous uptown swells like Halston, Truman Capote, Liza Minnelli and Bianca Jagger with gritty downtowners like Debbie Harry, Robert Mapplethorpe and Patti Smith. And if you lived in the provinces, you could keep up with the action in Andy Warhol’s Interview, the unofficial bible of the club, thanks to fawning copy from the likes of Glenn O’Brien and up close and personal photos by Patrick McMullan, Camilla McGrath and other snappers. In addition to Schrager and Rubell, the fashion designer Norma Kamali, journalists Anthony Haden-Guest and Bob Colacello, Chic’s Nile Rodgers, doorman Marc Beneke and other club regulars, business associates and staff, all give good talking head. Their voices provide a vivid sense of why Studio 54 felt special and the headiness of being allowed into this epicenter of fun. A palpable sense of the kicks to be had is provided by a wonderful rostrum camera shot of the hallway leading to the main dance floor. The soundtrack slowly fades up from a looming beat into a full blast of aural overload and for a few moments, you feel as if you are there in the club ready for the mysteries of the universe to be revealed…or at least, a fantastic Giorgio Moroder mix. Key Interviews with Ian Schrager, Norma Kamali, Stephen Gaines, Bob Colacello and others. Studio 54 is in cinemas from Friday June 15th.